Who will Design Your Patio? You have options for your patio design. 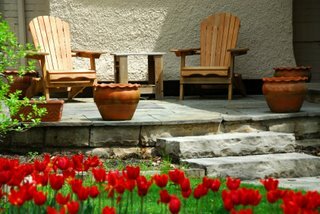 A professional landscape architect or landscape artist would certainly do an excellent job of considering your wants and needs while creating a truly unique and custom patio design. This would generally be the most expensive option. Many folks will decide to design their patio themselves. Everyone has a little bit of "designer" in them. Check out other patio designs that you like, perhaps your neighbors', or maybe at open houses or model homes. See different patios in person and come up with your initial concept. Check out some books on patio design. You'll find all kinds of potential ideas to combine into your dream patio. If you are computer handy, there is some great computer patio design software available. Put your ideas onto your own professional blueprints. Pre-designed patio and deck plans are also an option to consider. Just browse through the different sample designs and find the one that suits your needs best. You can always start with these and custom-tailor them to your personal needs. Keep in mind that some localities may require permits to build a patio. They may request a set of plans to review. What materials should be used in your patio design? Real Stone - Natural looking. Long lasting. Often expensive. Stone Veneer - The benefits of real stone, but lighter and less expensive. Brick - Very traditional, lasts a long time, can be new or "historical" bricks. Different patterns are possible. Not quite as expensive as stone. Pavers - Man made. Can sometimes look manufactured. Generally easy installation. Less expensive. Concrete (Stamped and Colored) - Very practical and increasingly popular. Often looks just like stone or bricks. Less expensive. Will probably need a professional with lots of experience to get the best-finished product. Concrete (Plain) - Most affordable option. Not always the most aesthetically pleasing, but can always be spruced up with brick borders, etc. All of these are good materials to use in your patio design. Of course you can use a combination of materials too. Another thing to think about is the material's color. Darker means more heat absorption and warmth. Lighter means a cooler appearance, and glare can be a concern. Your final choice will come down to your vision and your budget. Will you design a covered patio? You can probably think of a few more options yourself. Or, perhaps you would rather have no patio cover at all. Again, this is YOUR patio design! Who will build your patio? 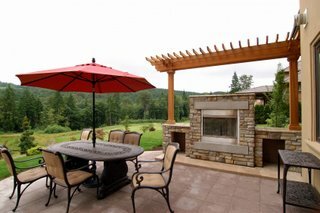 While you are designing your patio, it is important to keep in mind who will actually be building it. If you will have professionals design it, they will most likely have suggestions and their own ideas for you to consider in your plans. It might be best to consult with them and get their opinions before you start designing. Have you decided to make your patio a Do-It-Yourself (DIY) project? If so, more power to you. There is nothing better than tackling a project and then being able to admire the results for years to come, knowing that you did it all yourself. One thing to remember though...Do your research first and keep the design within your capability to actually build the project. Again, a permit may be necessary to build your patio. You will want to check into that before you start. Where do you build your patio? Most of the time, patio designs place a patio adjacent to a house with easy access from a central living area, such as a family room, living room, or kitchen. 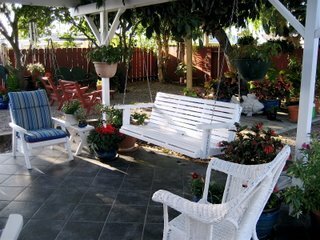 Often, patios are also found as components of outdoor living spaces such as gardens. You should put your patio wherever it will be convenient for what you will use it for. For example, if you would frequently use it for outdoor dining, consider having your patio outside of the kitchen. Most importantly, your patio is your patio. Put it where it makes you happy. Will you include an outdoor cooking area in your patio design plan? The most basic option would be to have a simple charcoal or gas grill to cook on your patio. Tried and true, this will do the job every time. If this is your intention, you really don't need to go into too much detail for this aspect of your patio design. However, if you want to have a built in grill island, you will need to do some measuring and come up with a solid plan (many grill islands are build of stone!) beforehand. In addition to a gas grill, your patio island can include a refrigerator, sinks, entertainment centers, or pretty much any amenity you could possibly imagine. The sky really is the limit. How big should your patio be? Your patio design should make your patio big enough to be comfortable and small enough to be intimate. Since a patio is really considered an outside room, think about how big you would want it to be if it was an inside room. 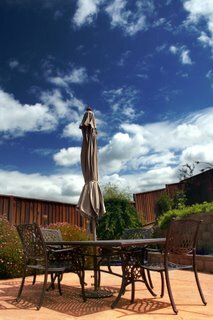 There are some rules of thumb, but it is your patio design after all! Make it your own. What type of patio furniture will you include in your patio design? Are you thinking about your patio furniture? Now is a good time. Patio furniture ranges from very cheap to outrageously expensive. Price really isn't what you are looking for though. You want quality pieces that are going to last many years to come. This does not mean that you'll need to spend great deals of money on your furniture. Just buy smart. 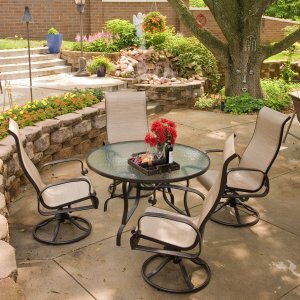 Perhaps you want the basic patio set...a table and a few chairs to surround it. This is probably the most essential place to start. In your search, you'll find a range of glass top tables, laminate top tables, iron furniture, aluminum patio furniture, wicker furniture, plastic furniture, and different outdoor wood furniture such as teak and cedar. Factors to help make your decision are finding what best matches your patio, your budget, and how long the furniture is made to last. But please also do one very important thing...Make sure the furniture is COMFORTABLE! After you find the essentials, other patio furniture to consider for your design would be lounge chairs, extra accent tables and chairs, garden benches, and patio swings (or porch swings). Also, many folks are doing built in benches, tables, etc. out of wood, concrete, brick, or stone. Hopefully we quickly covered all of the bases there. One last bit of furniture advice: You can always start with the basics and add new pieces over time. Think about finding classic designs rather than the more trendy stuff that will seem dated after just a couple of years. What other features should you include in your patio design? Fireplaces - What is better on a cool crisp night than sitting around a warm campfire? There is no reason you can't do this on your patio. One way is to build a stone fire pit on your patio. 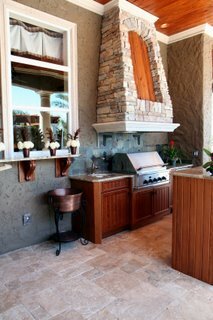 Or, you could find a nice metal or ceramic fireplace to compliment your patio décor. If you choose to go all out, you could have a pro install a gas burner for your fireplace so all you have to do is flip a switch and have instant fire. Whatever you do, please make sure your fireplace is far away from any thing that might catch fire. Fountains - Have the feel of nature surround you with a peaceful and tranquil water fountain or a trickling garden stream. Perhaps have a rock-lined stream leading to a small goldfish pond. Use your imagination. Waterfalls - Again, use some of the same ideas and build a backyard waterfall as part of your overall patio design. You could build it small or large, your choice. Pumps and equipment to make this all work are easy to find and affordable too. Hot Tubs - This is self-explanatory. While not cheap, they really do take your patio design to a whole other dimension. What do I use to decorate my patio? Patio décor is strictly a matter of taste. Use decor that helps to enhance the relaxing environment. Birdbaths, planters, clocks, and sundials are just a few outdoor accents to consider. How about using some fun tiki torches or light-up palm trees for a more tropical feel? Patio cushions can also make all the difference. You could also bring out some extra accent pillows when you use the patio. Enhance the mood with lighting. Special lighting and light fixtures can be used to really top off the whole patio design. Make sure and use waterproof and weather resistant lighting that's designed to be used outdoors. How will you pay for your patio project? Now that you are planning the design of your new patio, have you considered the best ways to finance it? Check out Home Improvement and Financing.com. This informative site has articles, tips, ideas and project plans to help you to enhance and improve your home together with "invest in your nest" advice on Financing and Insurance options for your Home Improvement Remodeling. Patio Materials...What's Your Patio Made Of? What materials will you use to build your new patio? Check out our complete patio material guide before you make your choice. Patio Tile... Want something different for your patio? Try Tile. A cheap patio idea is easy, especially if you draw inspiration from all of the budget home decorating shows on TV these days. It is hard to decide on patio flooring ideas. You can stick with tried and true patio flooring or choose an unusual patio floor. A good patio remodeling idea can be hard to come by. But most of the time, remodeling your patio is a better option than starting from scratch. Coming up with small patio ideas really depends on the reason you want to create a small patio. Want to put some do it yourself patio ideas into action? There are really great patio projects you can do on your own. Choose fun and beautiful low cost patio ideas to build or improve your patio without spending a bundle. Building backyard patios... Perfect places to unwind on a summer night. Need a few backyard patio ideas? These five patio ideas will be sure to please! Designing patio landscapes... Beautiful patio landscapes take great planning. One of these patio privacy ideas will make your patio much more relaxing. After all, privacy for your patio is preferred.